This stuff is not particularly great. It dries powdery and rubs off when brushed with a finger. 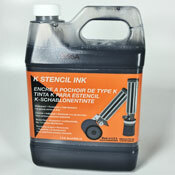 It might be decent for stencils, but overall, it's not a good ink for anything sturdy or permanent. The packaging says that it's intended for paper and cardboard, so they kind of own that up front. It's not xylene-based, but it does leach solvent/oil into the surrounding paper. I got this with the hope that I could use it for blackbooks/drawing indoors for fun -- I'm always on the hunt for a low-odor cheap, permanent black ink, but this definitely isn't it.